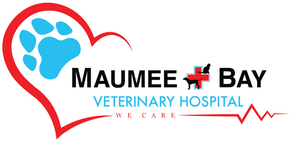 Maumee Bay Veterinary Hospital - Veterinarian In Oregon; OH; USA :: Overweight Cat? Here's Some Tips! FACT: Over 50% of cats in the USA are overweight and this number is on the rise! Fat Cat? Why does it matter? 1. Arthritis – Joint disease is one of the most common health affects of obesity. This can lead to issues going up or down stairs and also getting in or out of the litter box. This can lead to issues of inappropriate eliminations (going to the bathroom out of the litter box) or urinary tract infections or even stones (from holding urine). Some cats start to resent being petted due to discomfort from arthritis, which hurts the bond between you and your cat. 2. Heart Disease – Extra pounds puts strain on the heart, which over time can be life threatening. 3. Breathing problems - Excess fat increases pressure on the lungs and can interfere with normal function. Cats can’t tell you they feel short of breath. 4. Increased Risk with Anesthesia – Excess body fat makes surgery more challenging and thus prolonging the procedure. This in turn increases anesthetic time and increased time equals an increased risk of complications. Also the above issues with the heart and lungs increases the risk of anesthesia because these organs aren’t working normally. 5. Decreased activity – The combination of above complications of obesity decreases activity which affects the interaction between you and your cat! They play less, enjoy interaction less, and their quality of life declines. We know it isn’t Easy! Losing weight is not easy but, with time and commitment on your part, you can help your cat get back in shape. Even a small amount of weight loss can have a dramatic effect on your cat’s health! Weight loss improves quality of life and reduces the risk of serious health problems. It may even lengthen their life span as studies have shown that overweight pets’ lifespan is on average 2 years less than their ideal weight counterparts. Let us help you work up a diet plan that will be tailored to your Cat! Not all cats are the same - some like canned food versus dry food while some graze all day and some meal feed. There is not “one plan that fits all”. We will take this into account with our recommendations but in turn we need you to be open and honest about anything that the cat is being fed and also what is and isn’t an option for you. Multi-cat households can be exceptionally challenging when it comes to weight loss but there are ways to keep an obese cat separated even in group free choice feeding situations. Using a baby gate or cat door to keep the obese cat out or putting food up out of reach in an area that the obese cat can’t jump to are a few examples. Being on a diet doesn’t mean that you can’t show your cat love! We know that many people show their cats love through food but there are ways to still foster you and your pet’s special bond while dieting. 1. Give non-food “treats”. Substitute another form of love in for a treat such as petting, playing, or brushing. 2. If your cat is used to getting a treat when you get home, or at bedtime, then set back a couple pieces of food from their pre-measured daily amount to give at that time. 3. Use food puzzles – there are commercial food puzzles available or you can make one with an empty, clean pop bottle that has holes punched in it to allow food to fall out. These prolong the time it takes for your cat to eat their meal which helps them feel full, keep them entertained, and fosters their inner hunter! 4. Use low calorie treats for special occasions and always keep total calories per day into account!. Take into account that 1 oz of canned tuna in water is 36 kcal, 1 egg is 81kcal, 1 oz lean chicken is 52 kcal, ¼ cup of green beans is 9kcal, and1/4 cup canned pumpkin is 20kcal. So save those higher calorie treats for VERY special occasions and give green beans a try! 1. Catnip Snips – uses regular diet dry food! *Directions: Put cat food and water in bowl and mix well. Sprinkle catnip over mixture and mix again. If you want a soft treat then serve as is or drain excess water off if preferred. If your cat prefers a hard treat then form tiny bite size “cookies” and bake in a 350 degree oven for 15 minutes or until crispy. 2. Catnip Tea – no cooking necessary! *Directions: Put the catnip in a bottle and pour in the water Put the cap on the bottle and shake until the catnip tea is green. Cool before serving. 3. Kitty Yum Yum – as a treat or helpful when first decreasing amount of food fed – uses the regular diet canned food! *Directions: Cook vegetables until soft then mash with a fork and blend with cat food.